When I initially read My Sister Lives on the Mantelpiece, I was utterly gobsmacked by how powerful and thought provoking the novel is. Not only did I review the book and lavish praise upon it, but I’ve since championed the book and pushed friends and family to read it (I’ve also just discovered that a quote from my review, originally found on Libri Populus, was used for the inside cover of the paperback.). I’m very lucky to be able to promote the book even further here, with an interview with Annabel Pitcher, the author. 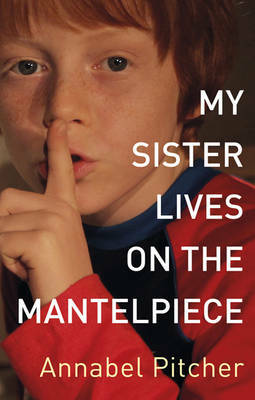 My Sister Lives on the Mantelpiece approaches subjects that many authors would shy away from, were you scared that it wouldn’t be well received or that the book would be deemed controversial? Not at all. I wrote it while travelling the world, completely engrossed in the story, not really considering other authors’ work or what was selling in the shops. I was totally hooked on Jamie and just wanted to write the most real, funny and moving book that I could. To me, the story didn’t feel controversial in the slightest and I certainly wasn’t trying to shock anyone or get a reaction – it just so happened to be the story that had popped into my head one night in Ecuador and my only concern was getting it down on paper in the best way that I could. It’s well documented that you wrote the novel in notepads on a trip to Ecuador after the inspiration from a film about 9/11. Once you had the basics down did you look anywhere else for further inspiration or research? Inside myself! That sounds incredibly cheesy, and I don’t mean it to, but this book came from the heart and I put everything into it that I have ever learned about humans, how they interact, how they suffer, how they overcome grief… I drew on my own experiences and all I’d observed in others. I also looked on websites devoted to those who lost their lives in terrorist attacks like 9/11, just to check that I was on the right lines in my portrayal of a family’s reaction to such a horrific and shocking event. Despite dealing with many difficult subjects (and there are many) the book is far from depressing and becomes uplifting and inspiring, how important to you was the use of humour to reach this balance? Absolutely essential. I did not want to write a book that was depressing or overly sentimental. I wanted to write a book that was about courage and hope and survival, rather than one that focused on misery and death and grief. The humour – particularly in Jamie and Sunya’s interaction – helped me to achieve that. Did you initially find it hard to write in the thoughts and speech of a ten year old boy? And what did you do to deliver it so well? Not at all! Jamie was so vivid to me, so real, that I found I could slip inside his head quite easily. That being said, I was extremely strict with myself, and edited the first draft extensively, taking out any sentences that sounded like Annabel talking, rather than Jamie. Even if I loved a particular passage, if it didn’t sound like Jamie, then it had to go! I think I probably wrote 1000 words for every 500 in the book. For me, strict editing is the key to creating an authentic voice. Who was your favourite character to write? Definitely Sunya! She provided so much light relief, and she just leapt off the page. Her first key moment in the book, when she is reading out her horror story in class and makes the teacher fall off her chair in shock, was one of my favourite sections to write. The book has been described in so many ways and features so many topics, but what does the book mean to you? For me, it is a coming-of-age tale, pure and simple. We see Jamie go from a position of not understanding the world around him, to a place where he can empathise with his father’s grief. At first, Jamie disappears into a fantasy world to cope with his life – believing his mother will visit, dressing up as Spiderman – but by the end he has the courage to stare reality in the face and accept it for what he is. He grows up, and the book is about how he does that. The cover design has changed radically from hardback to paperback, was that a decision from yourself and how do you feel about both covers? It wasn’t really my decision! I like both covers. The hardback, as it ties in with the trailer (See Below), worked really well, but I also like the quirky nature of the paperback. 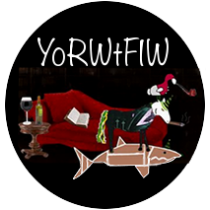 I think it captures the novel’s offbeat focus and sense of humour. With Sister and your upcoming second novel, Ketchup Clouds, both written for Young Adult shelves, what inspires you to write for that audience? I remember my own childhood and teen years very vividly, so it seems natural to write about characters of the same age. Also, teenagers are at a very interesting time of their lives – forming their own identities, questioning things for perhaps the first time, experiencing intense friendships – and I love exploring that as a writer. You were thrust into the writing world with the auctioning of the rights to the book and waiting to see a finished copy on shelves. How does it feel now to sit at home and realise that you’re a published author? Is it a dream come true? It had been an ambition for such a long time, and it was fantastic to finally see my book on the shelf. After all the hard work and effort, I get a thrill of excitement every time I walk into a bookshop and see Mantelpiece! When I sit at home and write, I just feel incredibly lucky to be making a living from something that I love to do, and something that I find challenging. How close are we to seeing Ketchup Clouds being released? And what else does the future hold for you? Ketchup Clouds is finished and will be out next summer, and I am already looking forward to that. In terms of the future, I am starting to work on several exciting projects, so we’ll see… I’d love to say more but it’s top secret at the moment. Watch this space! 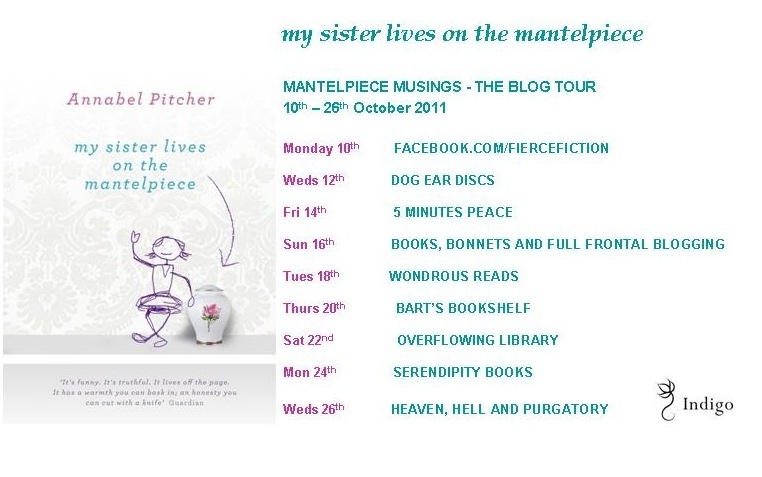 Please follow the rest of Annabel’s blog tour, you can see where she’ll be next on the image below. 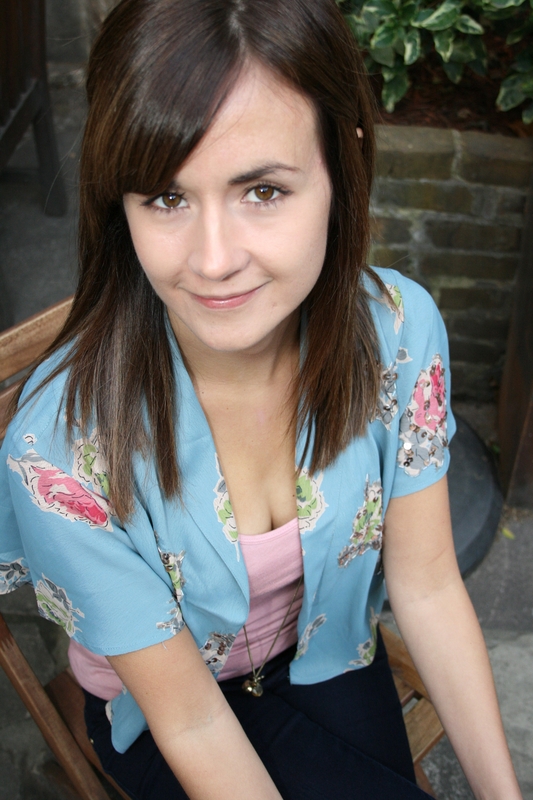 You can also follow Annabel on twitter – @APitcherAuthor. 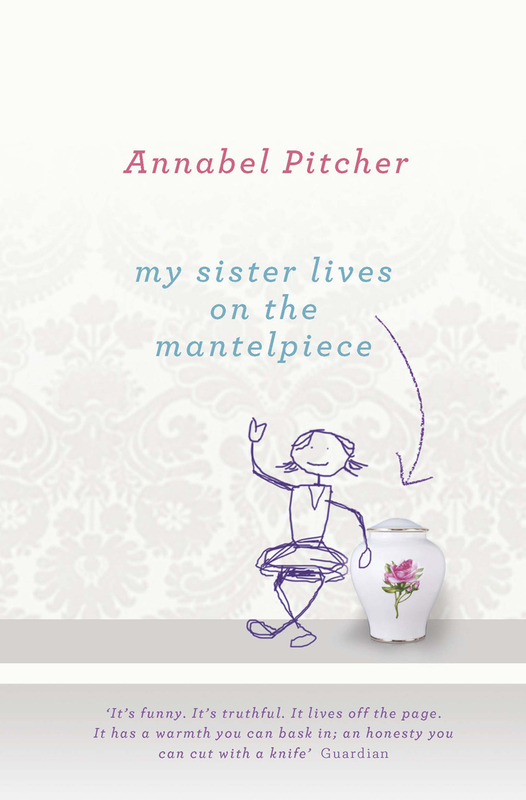 This entry was posted in Book, Feature, Interview and tagged Annabel Pitcher, Blog Tour, Feature, Interview, Ketchup Clouds, Mantelpiece Musings, My Sister, My Sister Lives on the Mantelpiece, When on October 12, 2011 by Dog Ear. Any books sent for review will be read and judged fairly. I won't be swayed on my opinions and will always deliver an honest review. Sometimes there will be books that just don't grab my attention for whatever reason, these may still be written about but no final review will be posted as it would be unfair to the author, publisher and work. I am a reader by heart and can only read what I fancy, when I fancy it. I aim to always review books that are sent to me out of kindness by the publisher, but sometimes older titles or charity shop bargains may sway me first. I always aim to review a book on or just before its publication date. Of course some may come later, in which case I will aim for the paperback release date, instead. This blog is written and edited by me in my spare time. I do not get paid or sponsored to write reviews or other content.